This Salmon Background Day of the Dead, Día de los Muertos Art Picture Pendant Necklace Jewelry is available with both Resin Art Dome and Glass Art Dome. 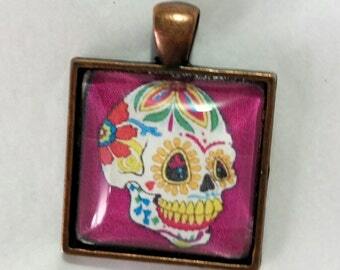 It features a Sugar Skull Art Skeleton with Salmon color background. Perfect Birthday Gift for Her or Him. With it's Gothic flair, it is fashionable and popular enough to wear year around. 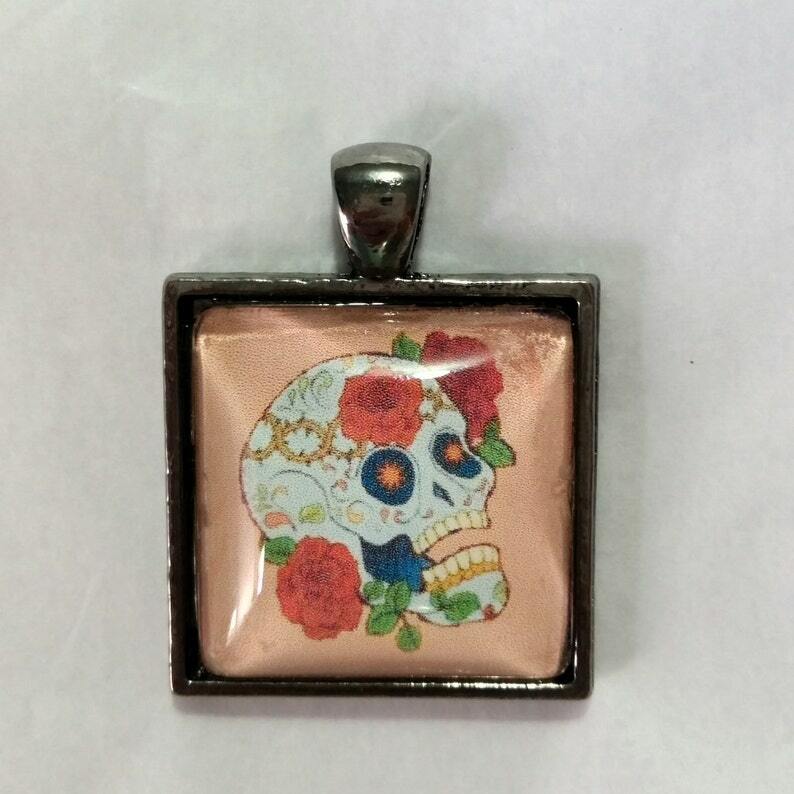 1 inch or Round Square Pendant with high quality digitized image. Your choice of Glass Dome or Resin Dome with Digitized Image on Back covered with Plated Frame and large bale. Perfect for Halloween Jewelry as well. Sugar Skulls are associated with the Mexican holiday, "Dia De Los Muertos" which has been celebrated for hundreds of years. Dia De Los Muertos translates in English to Day of the Dead. In simple it is a celebration to those loved ones that have passed on and a remembrance of them. It then spread throughout the Southwest United States and now nationwide. Day of the Dead is now also associated with "All Souls Day" and "All Saints Day" celebrations. 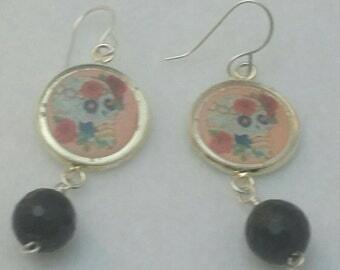 Sugar Skulls have also morphed into a very popular art of it's own genre. Your choice of Silver Tone, Antique Copper or Gun Metal finish. 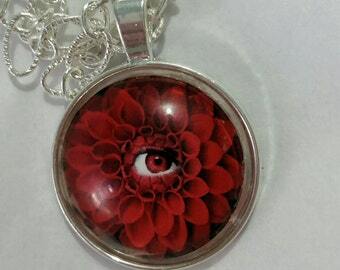 Glass Dome is available on Round Pendants. Included is up to 24 inch Rolo Necklace with a lobster clasp. Great look for the male or female enthusiast. Pendant is water resistant but not water proof. do no wear in pool, tub or shower. Each pendant is Handcrafted in our Studio in Tucson, AZ. Casual wear gift idea for her, gift for him.